Freshman Blake Burzell pitched a complete game to pick up the win for Laguna, which set a new CIF SS record for consecutive league wins by a public school at 46. Laguna set the consecutive league win mark for Orange County and the longest league win streak for a public high school in the Southern Section with its 46th victory this past Tuesday, May 4, over Calvary Chapel at the Vanguard University diamond. 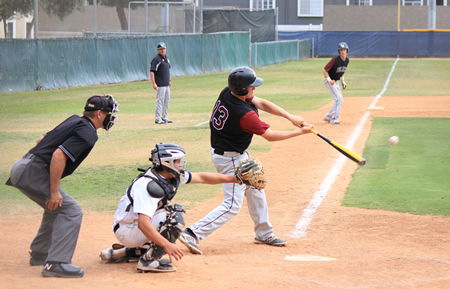 The win clinched the 2015 pennant for Laguna with a three game lead with three games remaining. Laguna holds the tiebreaker by having two wins over second place Calvary (18-6, 9-3). 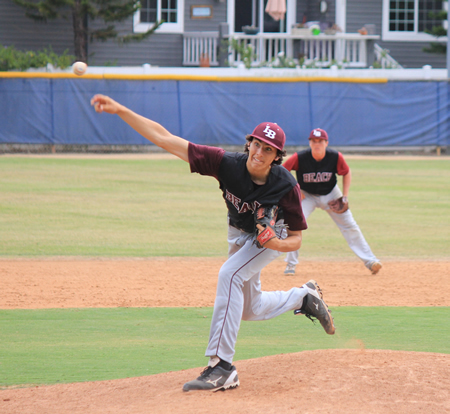 Breakers took an early 1-0 lead and held a 3-0 advantage before Calvary tied the score in the third inning. Laguna added one run in the fourth, three in the fifth and one in the sixth before giving up two runs in the Eagle’s finals two innings. Blake Burzell (Fr) went the distance for Laguna scattering nine hits allowing only three earned runs while another freshman, Jeff Bruyntjens went four for four in batting driving in four runs. The win broke the record set by twice by La Quinta/Westminster and trails only streaks set by two small private schools, 49 by Christian Center (1993-96) and 58 by Linfield Christian 1990-96). Longer state marks are held by Lowell (San Francisco CIF) at 70 and Quincy (Northern CIF) at 100. Breakers have now won their third straight league title and the program’s seventh in 77 seasons of baseball at Laguna. Sophomore Ashton Goddard went the distance striking out six as the Breakers survived a tough Estancia squad last Friday, May 1, at the Eagles field. Breakers took the early lead set up by three straight hits in the first inning and took a 6-1 lead after five innings as Jeff Bruyntjens led a two-out rally. Breakers still had to survive the final six outs as Estancia pushed in two runs but a determined Goddard pitched the Breakers out of the jams in both innings to secure the historic win that tied the OC league win record.